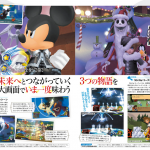 As promised, Kingdom Hearts HD 2.5 Remix has full appeared in the latest issue of Famitsu Weekly! 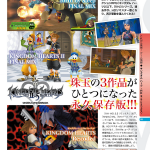 The issue shows off 5 pages of the three games involved included Kingdom Hearts II Final Mix, Kingdom Hearts Birth By Sleep Final Mix and HD cinematic experience of Kingdom Hearts Recoded. 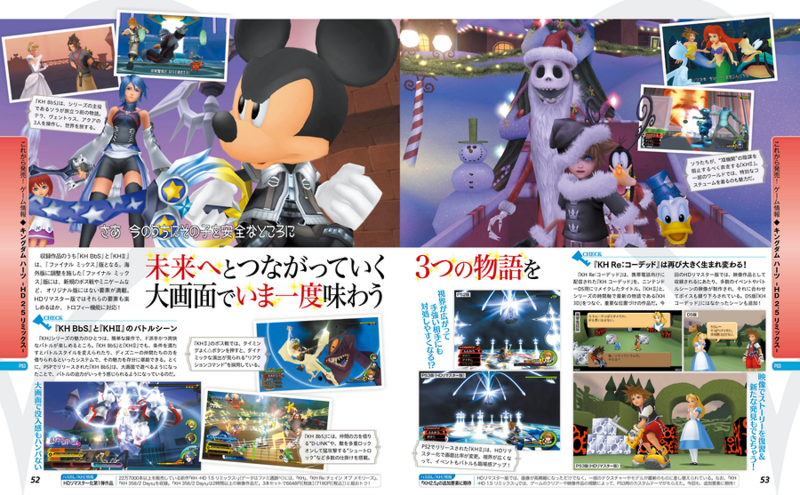 The issue also takes a look at Kingdom Hearts HD 1.5 Remix, Kingdom Hearts 3D, and Kingdom Hearts III. Thanks to sqnmr for the heads up and thanks to Exeforce87 for the HD images. Three works from the series have been HD remastered into one collection! See the bonds of friendship once again in HD quality! 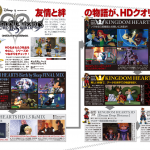 Three KINGDOM HEARTS titles released for the PSP, PS2, etc. will appear in one package! Numerous scenes in beautiful HD quality, the drama and excitement has been revived!! Focusing on the three HD works, check out their connection to the series! 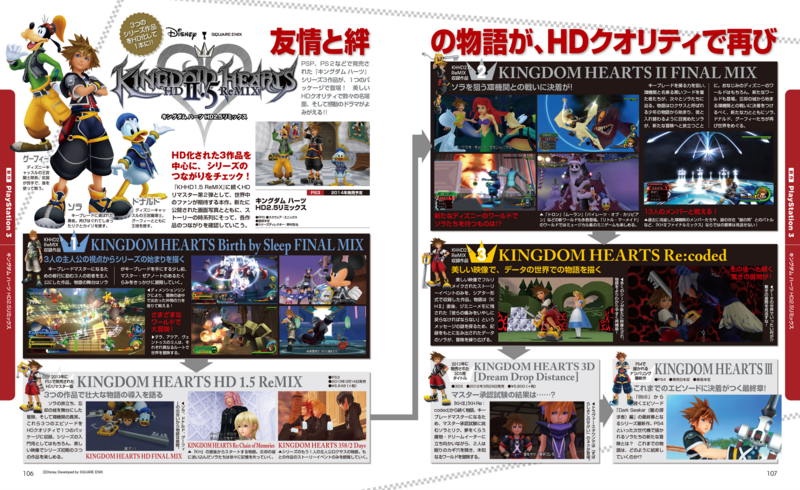 Many fans around the world have come to expect the second HD Remaster following after KINGDOM HEARTS HD 1.5 ReMIX. Newly released screenshots added along with examples of the story, check out their connection for each of the works. A hero chosen by the Keyblade. He searches for Riku and Kairi once again as they strayed paths. Royal Court Magician of Disney Castle. Together with Goofy, they search for The King. Royal Knight Captain of Disney Castle. He believes weapons are not good so he uses a shield to fight. See the origin of the series from the point of view of three heroes. Three young heroes train hard in order to become Keyblade Masters. Before Sora was given the Keyblade, it expands on the awakened plot of Master Xehanort’s plans. With the Dimension Link, fight with the help of friends in the midst of your adventure! A big adventure to many different worlds! Terra, Aqua, and Ventus each travel through a different route between the worlds. Organization XIII is after Sora and they must face each other. Black hooded figures who claim to be part of Organization XIII are after Sora one after the next; aiming to control the Keyblade’s power. The story begins with a boy named Roxas who awakens Sora in exchange for himself, a new journey for him begins anew. There are familiar and new Disney worlds that appear. In order to settle the fight against Organization XIII since their appearance from Castle Oblivion, they travel around the worlds with renewed vigor. What new Disney worlds await for Sora!? Many new worlds such as Tron, Mulan, and Pirates of the Caribbean appear. In the Little Mermaid world, you can enjoy musical minigames. You can battle against previous Organization XIII members who were defeated in Castle Oblivion and there is a mysterious presence of a “man in armor”. 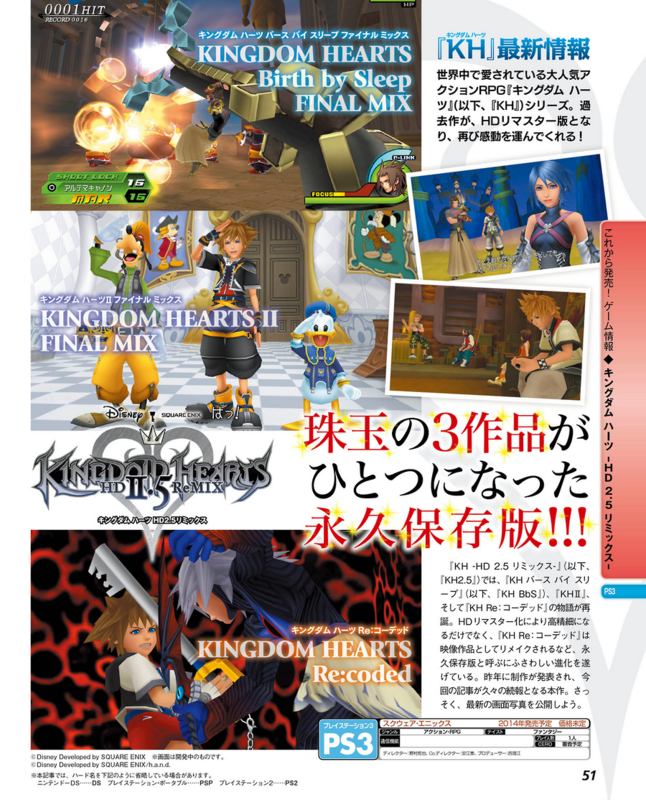 Do not miss these elements exclusive in KINGDOM HEARTS II FINAL MIX! Storyline events are remade in beautiful quality as part of a Theater Mode. In the story shortly after KINGDOM HEARTS II, Data Sora, generated by the journal’s data, goes on an adventure to explore the mysterious message “Their hurting will be mended when you return to end it” that was left in Jiminy’s Journal. Many scenes are visualized in a new and meaningful way to construct the story! There is a surprise that leads after this title. So what is in the data world!? Do not miss this additional surprise!